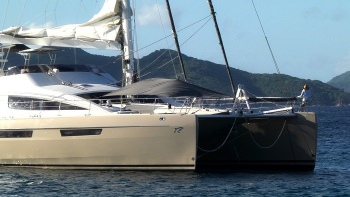 Catamaran Xenia 74 is a 2012, 74' Privilege catamaran offering crewed yacht charters in the BVI and USVI. 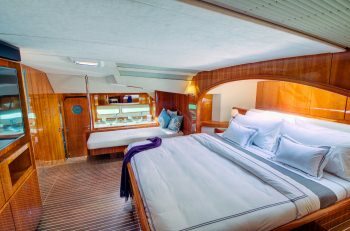 She features a fly-bridge deck, award-winning Chef, on-board scuba diving for certified guests, and accommodations for up to 8 guests in 1 Master King Suite plus 3 Queen cabins. 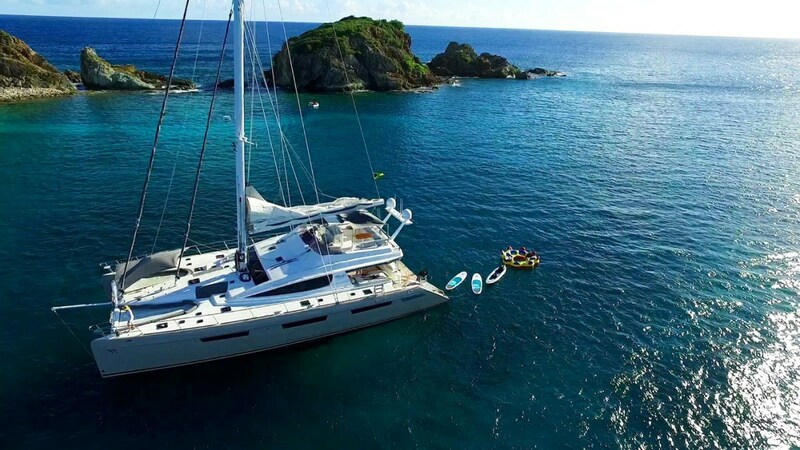 Catamaran Xenia 74 is a Carefree Yacht Charters high-end, exclusive selection for families, couples, divers, foodies, or special occasions. 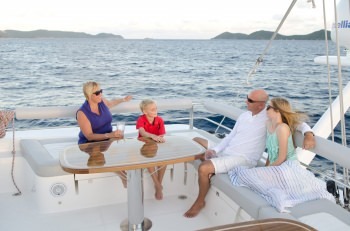 Here's what Tony & Kate told Carefree Yacht Charters about their favorite type of charter group (families, couples, foodies): "I would say that we enjoy each of those groups and we have a ton of experience with all of them. We have enjoyed families with three generations in the group (our youngest ever guest was two months old), and we have had a lot of couples celebrating life’s milestones which is always a lot of fun. It is always wonderful to feed foodies - we really enjoy them. I think it's safe to say we just really like people in general!" Rates from $38,700 to $49,000. View availability, rate details and current Special Offer. To learn more about this crew or for further details about XENIA 74, call us in our South Florida office at (954) 980-9281, toll free at (888) 670-6884 or fill out our Quick Request Form. Location Details: Happy to do Trellis Bay pick-ups and drop-offs.
. GENERAL RATES NOTE: All rates are for 7 nights, 8 days. 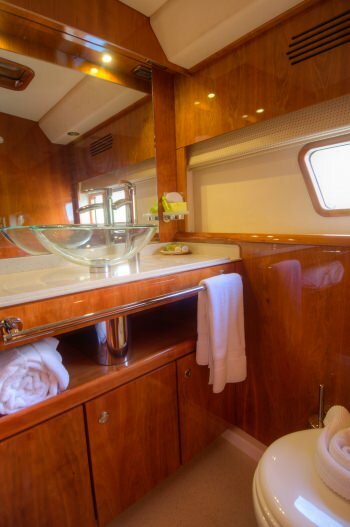 For short charters please use the �divide-by-6 rule� for figuring short charter premiums. 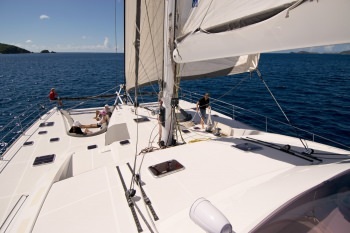 Charters of less than 6 nights available depending on schedule and season, please inquire. Preferred Virgin Islands pickup and drop point is STT. Inquire for other ports please. 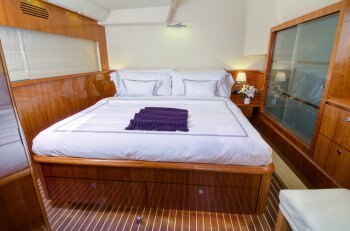 CHRISTMAS & NEW YEARS 2019/20: 1-8 PAX $57,488 7 night minimum, no specials apply Christmas charters must end no later than the 28th December. 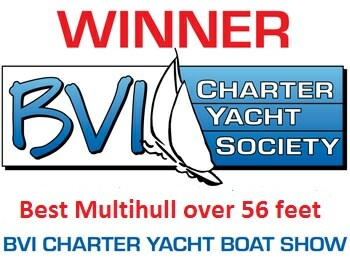 New Years week charters cannot begin earlier than 29th December. 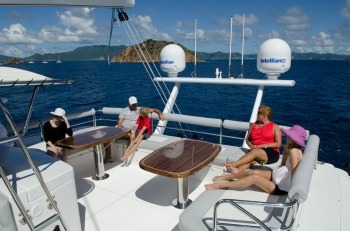 XENIA 74 - NON BVI BASED will include BVI Cruising Permits at this time. * * * S P E C I A L S * * * None at this time. .
Kate has been in the food preparation industry since 1984 and for several years was the manager of a small food retail chain throughout the railway stations of London. She has worked as a chef on yachts and in villas since 1999 and has loved pretty much every moment. She has attended a culinary course in France and has a food certificate from her early days in the food industry in London. Kate's close involvement in life in France has enabled her to learn firsthand the delights and rewards of delicious French cuisine. She has expanded her culinary skill and knowledge throughout her life. Kate has recently contributed to a recipe book with other top chefs from the island and appeared on the local TV show "Gourmet Galley with Chef Lisa". 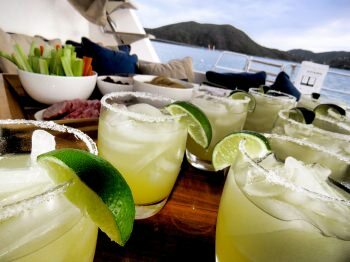 In addition to her chef and management duties at Golden Pavilion, Kate has also provided chef services for other prestigious villas and establishments, notably the Governor of the British Virgin Islands and the owners of Amway at Peter Island Resort. Tony and Kate have had a home in Brittany in France since 1991 and when they are not in the BVI's, they can be found drinking wine and eating cheese with their neighbours in France. 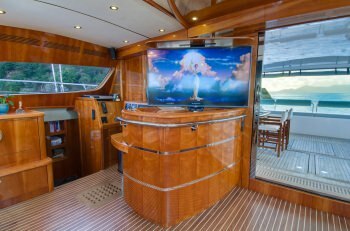 Every guest cabin has a 27- LED Apple TV with SatTV, hundreds of movies on our server. We had an absolute blast on the trip. 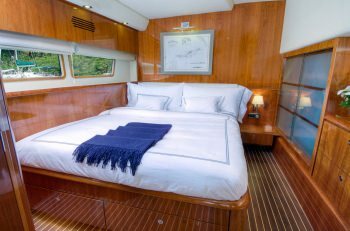 The Xenia 74 is an awesome boat, huge master suite, great other bedrooms and really nice outdoor space. The crew was amazing. Kate is a fabulous chef and we marveled how she could accomplish so much in a tiny kitchen. She kept us well fed with delicious breakfasts, lunch, snacks and dinner. Adam was a great first mate, friendly and outgoing, great with my kids and generally fun to be around. Katie was a great stewardess, always there with a drink or anything we need and super friendly and outgoing. I can't imagine having a better captain than Tony. Clearly he has been doing this a very long time, he knew everything about the islands and where to go and not to go. He is very adventurous and fun which was a great fit for my family and even took the kids on several treasure hunts through the islands and even had them bury some treasure of our own for others to find. 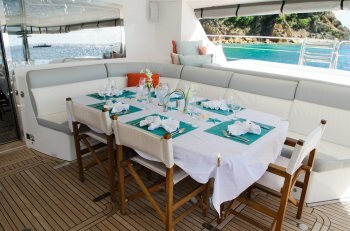 I would recommend the boat and crew to any of your clients and will definitely send some of my friends your way who are now interested in the trip and tell them to book the Xenia 74 through you. The charter was beyond perfect. As a matter of fact, at the end of the charter I asked Karen and our guests if there was even on minor suggestion that could have made it better? Everyone agreed it was perfect. At the end of the week none of us wanted to leave. 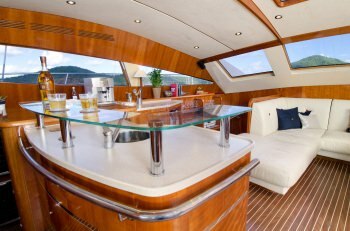 We will charter w Xenia 74 again. Gareth, Kristine and Jesse were all phenomenal. Professional in every aspect. They paid attention to every detail and exceeded all expectations. As a captain, Gareth was as good as they come. He got us in and out of Anagada and other anchorages with perfection. Gareth organized scuba, kayaks, standup boards, etc., etc. Kristine is a 5 star chef!! Every meal, every day was outstanding! Jesse was the best mate we've ever had (and we've done multiple charters). We offered to adopt him. 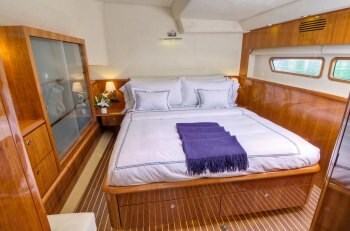 Xenia 74 is an exquisite catamaran. Every detail and finish of the ship is perfect. 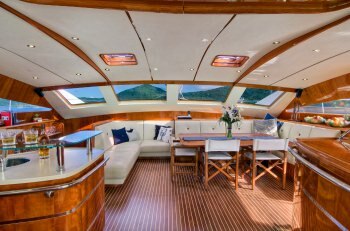 The owner of Xenia 74 should know he has a world class crew. 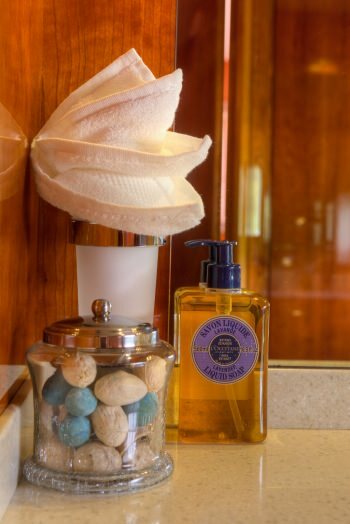 Carefree Yacht Charters served us extremely well. As you know, our plan for taking our children changed mid-contract. You worked with us and it all turned out perfectly. Please add us to your news letter. To say that we had an amazing vacation would be an understatement. 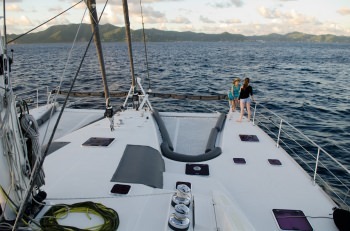 I just don't know how I can express how impressed we all were with our week aboard Xenia 74. Gareth, Kristine and Jesse were terrific. Easter was extra special with Kristine's decorations and traditional Easter dinner complete with real colored eggs and a fun Easter desert. Gareth found us a catholic mass to attend and is quite talented at folding napkins into Easter bunnies! And, to our surprise, the Easter bunny left a huge basket of treats for the kids. Food and drinks were superb. Kristine is a creative and skilled chef and we loved everything that she made. Jesse was always available to help us with gear and answer questions. He even turned us on to a new card game. Thank you for such an incredible opportunity to sail with you! We are at a YPO conference and have been sharing your contact and of course our fabulous experience. I'll look forward to your newsletter. Thank you!